As the time to think about next year is upon us, I just wanted to drop you a note at this time to clarify some issues with scheduling of classes for next year. If you want to take band, it CAN be done all four years. Sometimes, you have to make those who are making the schedule a little harder, but it can be done. BAND is both concert AND marching band. It is recommended that all high school students take both. CONCERT BAND is for members who are in concert band, but not marching band. Again, it is recommended that all students participate in both, but if you are playing football, volleyball, etc., you may register for concert band “only”, but you must have Mr. Keller’s permission to do so. Finally, If you have problems getting your schedule to work, do not give up. Keep working until it is the way you want it. However, don’t get greedy. You will NOT be able to take band, French II, creative writing, psychology, AND foods in the same term. Be realistic, and rely on your four-year plan to get you through. Please feel free to contact me if you have any problems getting band scheduled. 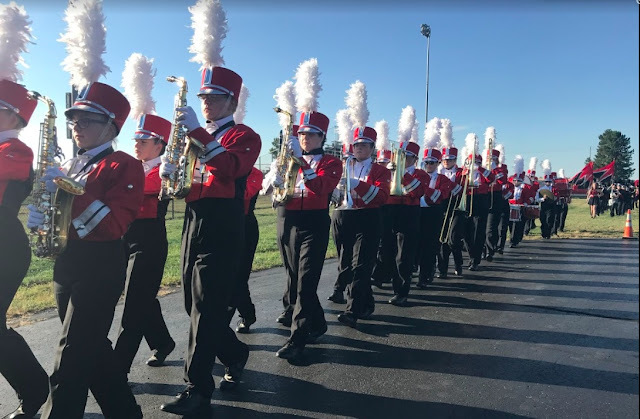 I’m so pleased that participation in our band program will again be on the rise!